voxeljet AG has its roots in the Technische Universität München (TUM). In 1995, three doctoral students at what was then the TUM’s Faculty of Precision Engineering made their first attempts at 3D printing in an obscure project entitled “Generating 3D structures”. A year later, they took part in the first Munich Business Plan Competition. And by 1998, the first patent had been licensed. In the same year, initial prototypes were made and the first sand molds were printed – one of the happiest moments in the three founders’ Startup phase. Today, voxeljet AG is one of the leading producers of industrial 3D printing systems and delivers on-demand additive manufacturing services. Its patented method is used for design samples, art pieces, architectural models, aerospace and automotive applications, in research and medicine, and in the film and entertainment industry. In May 1999, Ingo Ederer, Rainer Höchsmann and Joachim Heinzl founded Generis GmbH at the Technische Universität München (TUM). This predecessor to what is now voxeljet AG aimed to develop new generative processes for the production of cast and plastic components. The firm started out with just four employees at the TUM, but quickly moved to Augsburg. 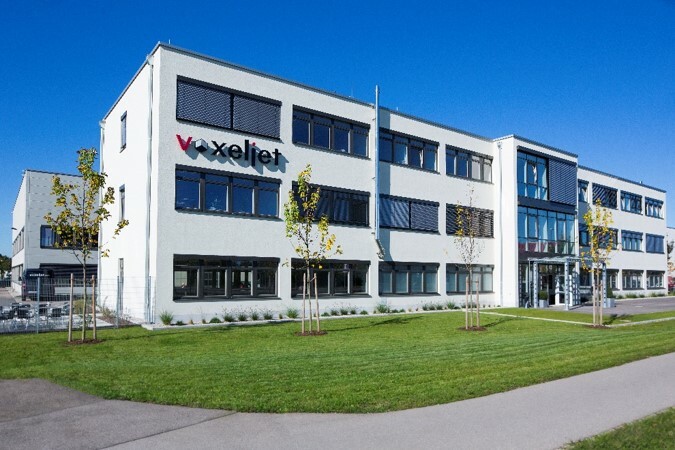 voxeljet AG is today headquartered in Friedberg, Bavaria. Successful participation in competitions assisted the fledgling company’s development. In the year 2000, the young company came fourth in the STARTUP business plan contest (the forerunner of the Deutscher Gründerpreis [German Startup Awards]). Beating off competition from 1,261 entrants from all over Germany, the company won a cash prize plus the free support of a top management consultancy for a year. One highlight in voxeljet’s early trajectory came in 2002, when it landed initial orders to supply big-name companies such as BMW AG and Daimler AG with large-format sand-based printers. Its growth did not stop there, however: In 2003, it opened a service center in Augsburg to provide customers with printing capacity on demand. In the same year, Bayern Kapital GmbH, Startkapital Fonds Augsburg and Franz Industriebeteiligungen AG all became shareholders in the company to support its continued growth. In the years that followed, the Startup became firmly established and developed new 3D printing systems. Existing systems were constantly being improved and refined, while production halls were expanded to keep pace with growing demand. In 2008, voxeljet technology GmbH was presented with one of the Bavarian Innovation Prizes [Bayerischer Innovationspreis] by then Minister-President Günther Beckstein. Two years later, voxeljet was already ranked among the 100 top innovators in Germany and received the “Top 100” hallmark of excellence. Once established on the market, the company focused its attention on research and development. 2011 thus turned out to be a year of technical innovation at voxeljet and the first fruits were unveiled in April, when the company entered a new dimension in additive manufacturing: Its brand-new VX4000 3D printing system enabled objects with identical resolutions to be produced up to three times faster than on previous systems. The world’s first continuous 3D printer (VXC800) allowed the building and unpacking process steps to be run in parallel without having to interrupt system operation, marking a major step toward industrial-scale volume production. In the same year, voxeljet celebrated the world premiere of yet another system – the VX1000 printer, specially designed to accommodate the growing demands of industry. The VX200, the smallest voxeljet system, debuted in 2012 as a low-cost point of entry to the world of 3D printing technology. Alongside all these system innovations, the company also developed a new material, Polypor Type C, which can now be used on request by customers to produce pure white plastic models. At the same time, the material satisfies more demanding requirements in terms of the strength and haptic qualities of models. Keen to avoid the trap of running short of capital, the company decided to go public and float its shares on the New York Stock Exchange in 2013. voxeljet technology GmbH thus became a stock corporation under the name voxeljet AG. The launch was a huge success: In October 2013, the IPO brought around USD 64.5 million into the company’s coffers (after deducting underwriting discounts, commissions and the estimated cost of the stock issue). Six months after going public, a capital increase gave voxeljet AG a further USD 41.4 million. Wide-ranging contacts to established distribution partners around the globe were instrumental in driving the company’s success. At the same time, customers also wanted to see the 3D printers for themselves – highlighting the importance of staying close to the market. Aware of this need, voxeljet began to set up its own international factory halls as demonstration service centers in 2014. In October 2014, it acquired British company Propshop (Model Makers) Ltd., making the wholly-owned subsidiary its first base outside Germany. Forms and models are produced at the service center in Canton, Michigan. The 3D printing systems process particle material that is applied to build spaces in 80 – 400 μm layers. A high-resolution print head then selectively prints the space with and affixes the binder, in line with the part specifications. The machine repeats both layering steps until the full height of the required object is reached. Any non-printed (i.e. loose) material is then removed, revealing the completed part. Depending on the intended application, the part can then be finished with a variety of materials. Diagram of voxeljet’s 3D printing process. Diagram of voxeljet’s 3D printing process. 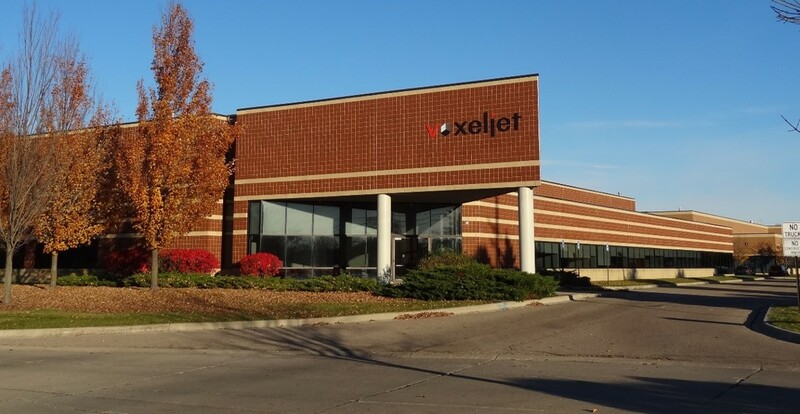 To learn more about voxeljet, visit the company’s website.